Care for yourself, your family & your neighbors. You’ve prepared. You’ve planned. You have your emergency kits in order and they are ready to go. You’re staying calm & you’re continually gathering information about the emergency you are now facing. 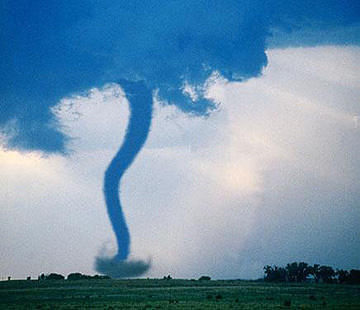 With that information you are adapting your emergency plans to this specific emergency. So you have your plan of action, now DO IT! This is the time that you hoped wouldn’t come, but you prepared for any way. Don’t hesitate. Seconds of delay could mean the difference between life and death. Get going! Now that the emergency is here, who do you take care of first? YOURSELF! Just like they tell you on the airplane, put the oxygen mask on yourself before you put it on your child. That sounds selfish, but think about it. How can you care for your child or any other person if you are incapacitated? Look after your own health and safety FIRST so that you CAN help others. YOU are your first priority, your family is your second, neighbors and the community are third. As you adapt your plan to THIS emergency, think about these ten things and how your preparations before hand and your current resources can be used for you and your family. Your first thoughts should be on SHELTER. 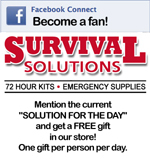 Find shelter from extreme temperatures, elements and physical danger, ie… escaping from a burning building, shelter from a severe thunderstorm or tornado, car breakdown or lost, earthquake or hurricane, terrorism or intruder. Because of the nature of emergencies, even the most prepared and self reliant of individuals can find themselves needing help. In the case of injury, misjudgment or just happenstance that puts us beyond our own means we will need to communicate our needs to others. That may be verbally or by calling 911, blowing on an emergency whistle or banging on something. It may require making a signal fire or using a signaling mirror. The important thing is to make contact and let someone know you need help. After securing yourself and your family, depending on the size and scale of the emergency there are going to be a lot of people that need your help. 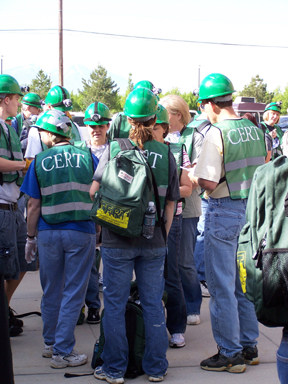 Take a volunteer emergency training class like CERT (Community Emergency Response Team) now to learn how to safely and effectively help others in a large scale emergency. Look at your neighborhood. You know there are a lot of people who take emergency preparedness for granted or even dismiss it all together. There are others like you who seriously try to prepare their families for a possible disaster. If there is a large scale incident, it won’t discriminate between the prepared and the unprepared, everyone is going to be needed to help everyone else. Think about your neighborhood. Are there any elderly or people who have difficulty moving unassisted? Are there any families with many children or who have special needs or disabilities? Talk to them now and discuss what help they may need in an emergency. After you have taken care of yourself and your family, is there anyone around that needs first aid? When you go to help, remember to check the environment around the victim for hidden dangers. You don’t want to become a second victim and double the problem. After checking the environment, check the victim to determine what is wrong. Call for available help and give care to the victim as far as you have been trained. In an emergency situation, you do what you need to do to help you, your family and those around you to survive the duration. After the emergency, working together, you can rebuild and return to normal life as quickly and completely as possible. 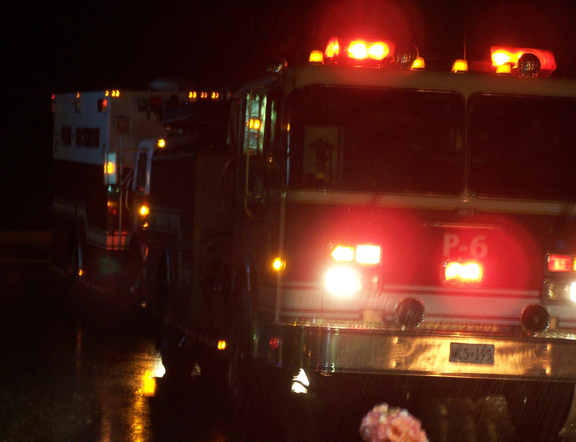 In a large emergency, professional emergency responders will not be able to help everyone. What is an emergency? Any disruption of normal activities. These can be naturally occurring emergencies like hurricanes, tsunamis, and earthquakes. They can be accidental, manmade emergencies like dam breaks, power failures, chemical spills and car accidents or intentional like terrorism. Large emergencies can affect nations and states while smaller emergencies affect cities, neighborhoods, families and individuals. Even a loss of a job can be an emergency. No matter the size of the incident, it is still an emergency to those affected. Depending on the LOCATION, SIZE, and SEVERITY of the incident; professional emergency responders may not be able to give you any assistance – NO MATTER HOW CRITICAL YOUR SITUATION MAY BE. In large-scale disasters, emergency responders’ first priorities are in areas like schools, businesses, government buildings and areas with large numbers of people. Individual residencies may be left on their own for days or even weeks. The answer is Emergency SELF RELIANCE. We must be prepared to care for ourselves, our families, our property and neighbors for a MINIMUM of 3 days or longer without any professional or outside help. No matter what the emergency is, no matter where you live, no matter who you are, no matter what resources you have; there are things you can do to help you and your family’s survival and recovery. I just started this blog to get out the information I have learned in my own research, studies, learning and experience in the emergency preparedness field. Please feel free to refer us to your friends and neighbors. The more people are prepared, the less people will be a burden on those who are. Will you be part of the solution or the problem?